Abstract This overview compares and synthesizes the articles of this theme issue. It highlights that progress has been made toward the goals of marine ecosystem-based management (EBM) in tropical regions. Four key findings are presented: (1) Tailoring EBM to specific contexts ultimately determines success. (2) Employment of a wide variety of marine management tools is necessary and complementary to spatial management through marine protected areas (MPAs). 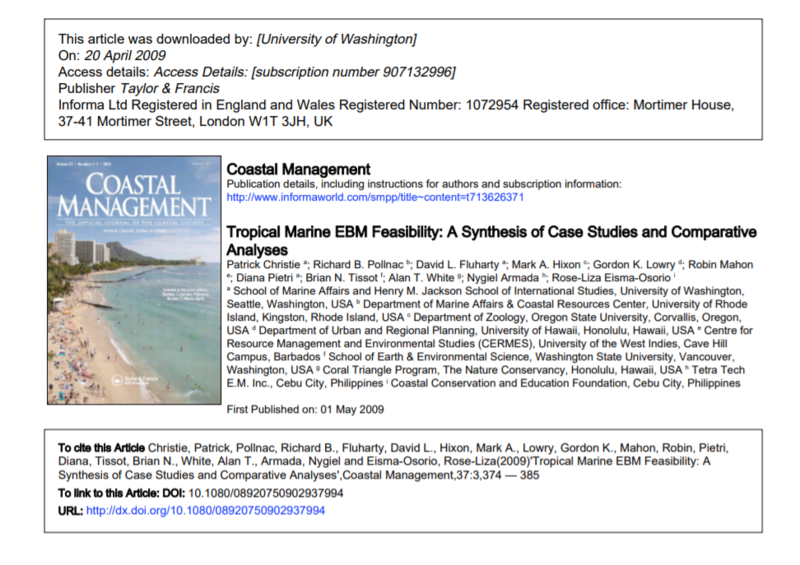 (3) Although EBM approaches may be usefully defined using oceanographic and ecological principles, the design and implementation of feasible EBM will require, at least, equal consideration of governance and social conditions. (4) Interest in EBM has grown rapidly; however, this approach only improves ocean resource management if sustained by commitments from, at least, policymakers, resource users, and donors. Practical program design principles stressing the importance of leadership development, awareness raising, institutional reform, conflict resolution, adaptation, and evaluation are derived from these case studies and comparative analyses. A suite of empirically based EBM evaluative criteria, which can be adapted to local contexts, are suggested to fostered learning and progress.